Yeah for going to Mom’s and having her veganize an old recipe and then allowing me to share it with all of you. This was so good! I am actually going to add it to my Easter menu ideas because it would be a perfect, fairly simple main course. Heat olive oil and 1 tbsp butter in a frying pan. In a bowl mix 1 cup flour, salt and pepper. Dip each cutlet into flour mixture so they are covered on both side. Add cutlets to oil/butter and heat on both sides until brown. Remove cutlets from heat and set aside covered. In same frying pan add mushrooms. Cook mushrooms for about 5 minutes on med/high heat until they are beginning to cook but are still firm. Add 1 tbsp butter and cook until melted. Add 1 tbsp flour and cook 5 more minutes. Slowly stir in lemon juice. Stir in water and sugar. Add parsley and capers. 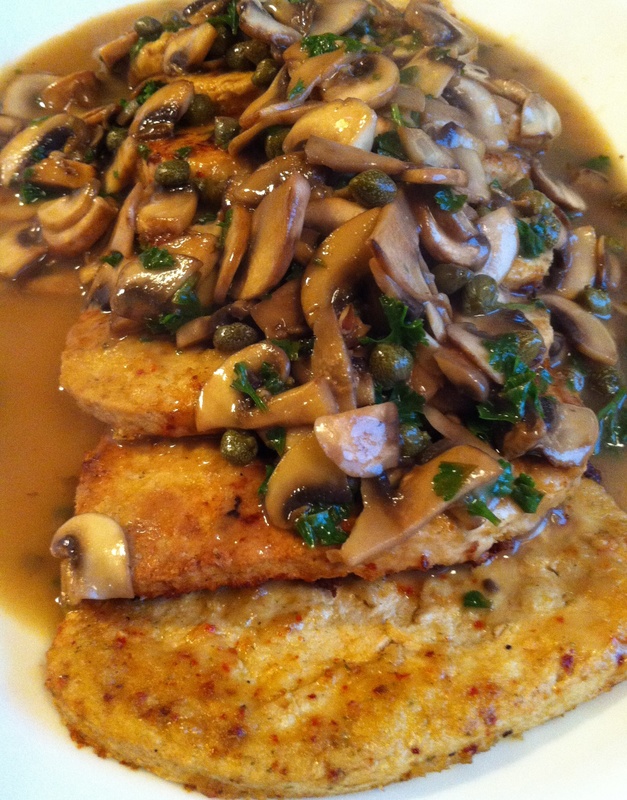 Arrange cutlets on a serving platter and pour mushroom sauce over . Mom served it over cooked pasta. That is so cool! Thanks for sharing. I will also pass this on to my mom who created this one. It is always a bonus when the kids like it!